Background Asian Indian women are predisposed to develop obesity, metabolic syndrome and vitamin D deficiency. Relationship of vitamin D deficiency with blood glucose levels has not been explored in Asian Indian women with pre-diabetes. 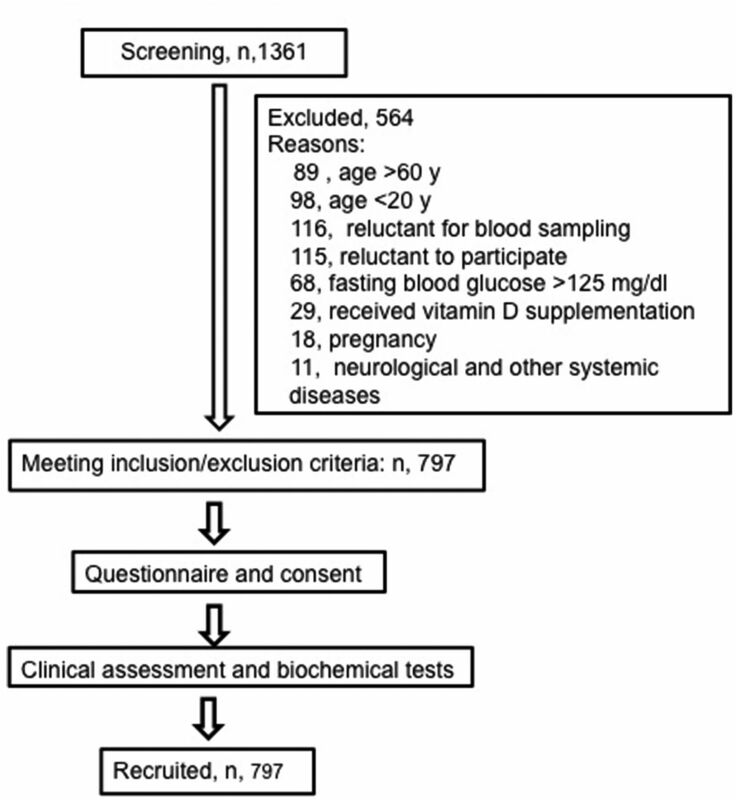 Objective We evaluated the associations of serum 25-hydroxy vitamin D (25(OH)D) concentrations among adult women with the pre-diabetes residing in North India (Delhi). Methods This cross-sectional population-based study involved 797 women with pre-diabetes aged 20–60 years. Blood pressure, body mass index (BMI), fasting blood glucose (FBG), extent of sun exposure and serum 25(OH)D levels were assessed. For purpose of analysis, serum 25(OH)D levels (nmol/L) were categorized in quintiles as follows: 0–21.5 (first quintile), 21.51–35.60 (second quintile), 35.61–46.50 (third quintile), 46.51–62.30 (fourth quintile) and >62.31 (fifth quintile). Result The prevalence (%) of vitamin D deficiency, insufficiency and sufficiency was 68.6, 25.9 and 5.5, respectively. Mean age (p=0.004), systolic (p=0.05) and diastolic (p=0.04) blood pressure, weight (p=0.03), BMI (p=0.04) and FBG (p=0.02) were significantly higher in subjects with vitamin D deficiency as compared with those with vitamin D insufficiency and sufficiency. Unadjusted mean values of FBG were significantly decreased in fourth (p=0.02) and fifth quintiles (p=0.030) of 25(OH)D levels as compared with second quintile. Furthermore, after adjusting for age and family income FBG levels were significantly increased in first quintile (compared with fourth (p=0.012) and fifth (p=0.018) quintiles) and second quintile (compared with fourth (p=0.003) and fifth (p=0.004) quintiles) of 25(OH)D levels, respectively. Conclusion Lower vitamin D levels are associated with higher blood glucose values in Asian Indian women with pre-diabetes. These findings need confirmation in case–control and prospective studies. Previous research has shown that subjects with pre-diabetes and low circulating 25(OH)D levels are insulin resistant and have impaired β cell function. This is first study (in context of pre-diabetes and vitamin D ) on carefully selected large sample of Asian Indian women, showing significant relationship of lower vitamin D levels with higher fasting blood glucose levels. In view of above association, intervention trials with vitamin D are needed in Asian Indian women with pre-diabetes to evaluate if diabetes could be prevented. Only a few studies have been done in India regarding insulin resistance, hyperglycemia and vitamin D deficiency. No association has been reported between vitamin D levels, body mass index (BMI), T2DM and hemoglobin A1C across the spectrum of glucose intolerance in Asian Indians residing in Western India.13 In a cross-sectional study in East India, individuals with pre-diabetes (n, 157) were investigated for vitamin D deficiency and insulin resistance. In this study, individuals with vitamin D deficiency showed significant inverse correlation to insulin resistance and positive correlation with insulin sensitivity.14 Further, same authors showed significantly lower levels of serum adiponectin and serum 25-hydroxy vitamin D (25(OH)D) and higher serum insulin levels in persons with pre-diabetes or T2DM as compared with controls.15 Of note, all above studies in India involved limited number of subjects and have included individuals from both genders. In view of propensity of Indian women to have obesity, metabolic syndrome and consequent hyperglycemia and low serum 25(OH)D levels, an investigation on larger number of women at high risk for development of diabetes is required. We conducted a cross-sectional population-based study approved by the institutional ethics committee. Subjects were randomly selected to have approximate representation from each income group (high-income group ~10%, middle-income group ~65%–70%, and low-income group ~15%–20%) from 35 residential locations according to the approximate proportion of individuals living in Delhi. After informed consent, fasting blood glucose (FBG) levels were done in 1361 women (20–60 years of age) from June 2012 to June 2017. Among this group, 797 women were categorized as having pre-diabetes (figure 1). Subjects who received vitamin D or calcium supplementation in the previous 6 months, any medication which could affect insulin sensitivity, vitamin D or calcium metabolism (eg, metformin, thiazolidinediones, steroids, and so on) within the last 1 month, those with pregnancy, severe end-organ damage or chronic diseases, malignancy, and known diabetes mellitus and other endocrine disorders were excluded from the study. Demographic and clinical profiles, medical history (personal and family), socioeconomic characteristics, skin exposure to sun and overall duration of sunlight exposure were determined with the use of prevalidated questionnaire. Skin exposure was recorded by per cent of body surface area (face/hands, face/hands and arms, and face/hands and legs) exposed to sunlight. The duration of sunlight exposure (min/day) was assessed in the following manner: <5 min, 5–15 min, 15–30 min and >30 min. Blood pressure was measured by a standard mercury sphygmomanometer, over the right arm in sitting position. Weight and height were recorded, and BMI was calculated. FBG was analyzed as previously described.16 Serum 25(OH)D levels were measured by chemiluminescence method (DiaSorin LIAISON 25-OH D, Stillwater, Minnesota, USA). The LIAISON 25(OH)D assay is a direct competitive chemiluminescence immunoassay for quantitative determination of total 25(OH)D in serum sample.17 The intra-assay coefficient of variation was 1.61% and the interassay coefficient was 2.06%. Overweight and obesity were defined as BMI 22–24.9 kg/m2 and >25 kg/m2, respectively.18 Blood pressure ≥130/85 mm Hg (or on antihypertensive therapy) was defined as abnormal. Pre-diabetes was defined as FBG levels >100 and 125.9 mg/dL.19 Serum 25(OH)D levels were categorized as follows: deficiency <49.9 nmol/L, insufficiency 50–75 nmol/L, and normal more than 75 nmol/L.20 Serum 25(OH)D levels (nmol/L) were categorized in quintiles as follows: 0–21.5 (first quintile), 21.51–35.60 (second quintile), 35.61–46.50 (third quintile), 46.51–62.30 (fourth quintile) and >62.31 (fifth quintile). Because many values of 25(OH)D were clustered around cut-off values of quintiles, slightly different numbers of subjects were segregated in each quintile. Data were entered in an Excel spreadsheet (Microsoft, Washington, USA). The distribution of demographic, clinical, medical history (personal and family), socioeconomic and behavioral characteristics, sun and skin exposure and biochemical parameters was confirmed for approximate normality. We used mean and SD and number (%) to summarize the variables. Comparison of general characteristics, mean of variables and proportion of risk factors by serum 25(OH)D status groups including mean of serum 25(OH)D levels were performed using Fisher’s exact test and non-parametric statistics such as Kruskal-Wallis tests (post hoc by Bonferroni’s method). The correlation regression was calculated using Spearman’s test. After adjusting for age and family income (surrogate of socioeconomic status of the family), one-way analysis of variance (ANOVA) and analysis of covariance were carried out. All statistical analyses were performed using SPSS (V.21.0, SPSS). For all above, p value of<0.05 was considered as statistically significant. Educational status (p=0.004), employment status (p=0.003), family income (p=0.05), skin exposure (face and hands) (p=0.05) and sun exposure (5–15 min/day) (p=0.04) were significantly higher in subjects with vitamin D sufficiency as compared with those with vitamin D deficiency and insufficiency (p=0.030). We did not find any significant association of 25(OH)D with demographic, personal and family medical history, and tobacco and alcohol consumption (p>0.05) (table 1). BMI less than 22.9 kg/m2 (normal BMI): 193 (24.2%). BMI between 22.9 and 24.9 kg/m2 (overweight): 112 (14.1%). BMI equal to or more than 25 kg/m2 (obese): 492 (61.7%). Hence, total number who are non-obese (A plus B): 305 (38.3%). The mean±SD for age was 42.02±11.4 years. Mean age (p=0.003), systolic (p=0.05) and diastolic (p=0.04) blood pressure, weight (p=0.003), BMI (p=0.04) and FBG levels (p=0.013) were significantly higher in subjects with vitamin D deficiency as compared with those with vitamin D insufficiency and sufficiency (table 2). The prevalence (%) of vitamin D deficiency, insufficiency and sufficiency was 68.6, 25.9 and 5.5, respectively. After stratifying the sample according to serum 25(OH)D quintiles, we observed age (p=0.002) was significantly increased in the first quintile as compared with other quintiles. Further, family history of diabetes (p=0.03) was significantly higher in the second quintile as compared with other quintiles (tables 2 and 3). We did not find any significant difference of FBG values (mg/dL) between three categories of individuals as determined by BMI: (A) 110.5±7.8, (B) 109.9±7.7 and (C) 110.6±7.4 (p=0.69). Further, we did not find any significant difference vitamin D (nmol/L) levels between three categories of BMI: (A) 43.6±20.9, (B) 41.7±21.6 and (C) 41.9±22.1 (p=0.62). Unadjusted mean values of FBG were statistically significantly decreased in fourth (p=0.02) and fifth quintiles (p=0.030) as compared with second quintile. Furthermore, after adjusting for age and family income, we observed FBG levels were significantly increased in the lowest 25(OH)D quintile (compared with fourth (p=0.012) and fifth (p=0.018)) and second quintiles (compared with fourth (p=0.003) and fifth (p=0.004) quintiles), respectively (table 4 and figure 2). Box plot showing distribution of fasting blood glucose levels according to 24(OH)D quintiles. This study shows that higher FBG levels are associated with lower vitamin D levels in Asian Indian women living in North India with pre-diabetes. Blood glucose and 25(OH)D levels in this cohort were not influenced by BMI category, or in other words, by overweight and obesity status. Such findings in a large cohort of Asian Indian women have been reported the first time. While the strength of this study was large number of subjects and careful selection criteria, limitations included cross-sectional of nature of the study, absence of a control group of normoglycemic individuals, and non-availability of calcium, phosphorus, parathyroid hormone and calcitriol levels. A more robust statement regarding relationship between 25(OH)D and FBG could be made if serum calcitriol levels were available. Having stated that, association of low vitamin D levels with hyperglycemia in human beings continues to be researched and debated. Specifically, individuals with pre-diabetes have been less investigated in the context of vitamin D deficiency (table 5). These data highlight some important information; first except a few, most studies have been done in limited number of subjects. Second, no investigator has specifically focused on women with pre-diabetes. Abbasi et al25 showed that subjects with pre-diabetes and low circulating 25(OH)D levels were most insulin resistant and had impaired β cell function as compared with normal fasting glucose-vitamin deficient and normal fasting glucose-vitamin D sufficient subgroups. In National Health and Nutrition Examination Survey (2001–2006), average vitamin D levels decreased steadily across range of FBG levels in Caucasian men and women; with mean concentrations (nmol/L) of 66.2, 62.3 and 54.2, respectively. In this study, mean concentration of vitamin D was significantly lower in individuals with pre-diabetes and diabetes as compared with those with normoglycemia.26 In a longitudinal cohort study, Deleskog et al27 showed that high serum 25(OH)D levels predicted a reduced risk of converting to diabetes from pre-diabetes, but this was not seen in those with normal glucose tolerance. Internationally, there have been several trials on vitamin D supplementation in individuals with pre-diabetes and diabetes. In a meta-analysis (10 randomized controlled trials) of effects of vitamin D supplementation on insulin resistance and pre-diabetes, homeostatic model assessment of insulin resistance did not show any change. However, vitamin D supplementation reduced FBG and HbA1c levels.32 A systematic review and meta-analysis of 23 randomized controlled trials (n, 1797) showed no significant effect in change of HbA1c after vitamin D intervention as compared with placebo. However, a significant effect of vitamin D supplementation was seen on FBG in four studies with a mean baseline HbA1c ≥8%.33 Overall, it appears that further trials are warranted with vitamin D supplementation in individuals with pre-diabetes. The relationship of FBG with vitamin D deficiency necessitates further research (case–control studies including individuals with normoglycemia, cross-sectional and prospective cohort studies) in Asian Indians. This study shows that low serum 25(OH)D levels are associated with higher blood glucose values in Asian Indian women with pre-diabetes. The authors acknowledge the contribution of Mr Rajesh and Mrs Indu who performed routine biochemical investigations. 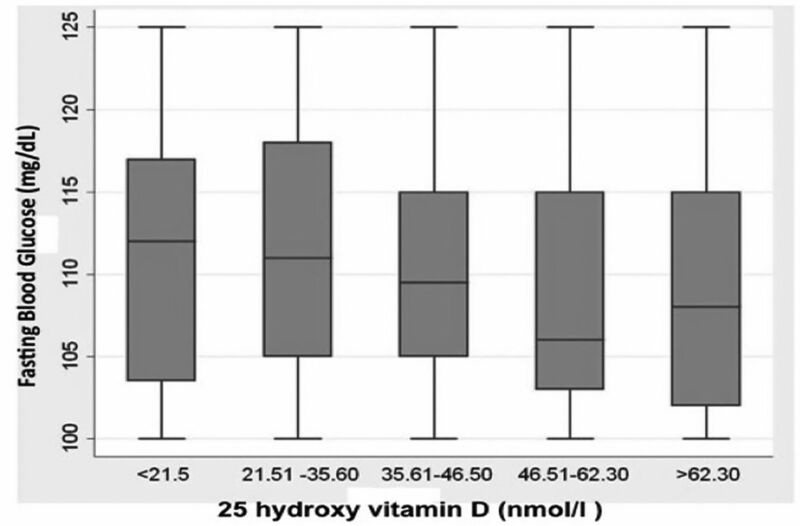 The cooperation of the subjects who took part in the study is greatly appreciated.
. Vitamin D status and bone mineral density in women of reproductive and postmenopausal age groups: a cross-sectional study from south India. J Assoc Physicians India 2011;59: :698–704.
. Serum vitamin-D predicts insulin resistance in individuals with prediabetes. Indian J Med Res 2013;138:853–60.
. A case-control study on insulin resistance, metabolic co-variates & prediction score in non-alcoholic fatty liver disease. Indian J Med Res 2009;129:285–92.
. LIASION 25 hydroxy vitamin D Total premarket notification. Available athttps://www.accessdata.fda.gov/cdrh_docs/pdf11/K112725.pdf (accessed October, 2017).
. Consensus statement for diagnosis of obesity, abdominal obesity and the metabolic syndrome for Asian Indians and recommendations for physical activity, medical and surgical management. J Assoc Physicians India 2009;57: :163–70.
. Standards of medical care in diabetes. Diabetes Care 2017;40:S11–24. Contributors AM conceived the study and contributed to the discussion and reviewed the manuscript. SPB conducted the study and wrote the manuscript. SPB, SG and NS performed laboratory analysis of samples. RMP analyzed and interpreted the data. AM is the guarantor for this manuscript. Funding This study was fully supported by a grant from the Department of Science and Technology, Ministry of Science and Technology (File No: SSD/WS/098/2010), Government of India. Disclaimer The funding agency had no role in study design, data collection, and analysis, decision to publish, or preparation of the manuscript. Ethical approval Fortis C-DOC Centre of Excellence for Diabetes, Metabolic Diseases and Endocrinology, Chirag Enclave, Nehru Place, New Delhi.